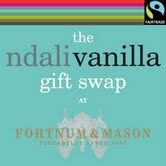 If you read my posting on the Ndali Vanilla Fairtrade Gift Swap you'll know that I was so moved by a report on the BBC Radio 4 Food Programme featuring the Ugandan vanilla growers that I asked to attend a Fairtrade event. The 'Ndali Fairtrade Gift Swap' was organised by food writer and broadcaster Vanessa Kimbell to raise the profile of these growers and get more people to consider buying Ndali vanilla. 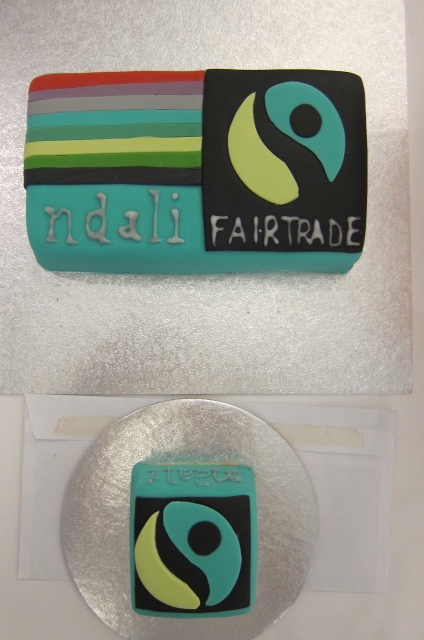 A rainy Monday saw 40 of us gather to listen, talk and ask questions about Fairtrade and Ndali vanilla production. We also took along gifts of cakes, biscuits, preserves and sweets, all containing Ndali vanilla, to swap at the end of day. To add a fun element the categories were judged by experts including food writer and journalist Lucas Hollweg and chocolatier Chantal Coady. With some of the best blogger bakers and preserve makers in the room it was a tough task. The photographs here show a selection of those gifts which caught my eye. Fortnum and Mason hosted us kindly and elegantly. 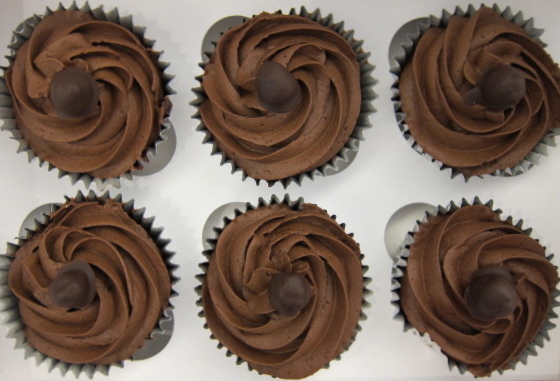 Kenwood provided handsome prizes for the winners but no-one went away empty handed. Eileen Maybin of the Fairtrade Foundation made sure we all had a few gifts to remind us there are other good Fairtrade products out there. Apart from regularly buying Fairtrade Windward Isles bananas, mainly because they taste better than any other, I have to admit Fairtrade has not been high on my shopping criteria. Taste has always come first for me and always will. Another Fair Trade product I routinely buy is Ndali vanilla, because it is better than any other vanilla. So I've found two foodstuffs which are the best of their kind that happen to be Fairtrade. It's no coincidence that Fairtrade helps small growers/producers and these are often the ones who put the care into distinctive, quality products. Quite likely there are more out there and I intend to look for them in future rather than picking up the packet of sugar or chocolate, or whatever, I usually pluck from the shelf. If you are in any doubt, as I was, that Fairtrade makes a difference to the lives of farmers, read about the Ndali vanilla growers for yourself and pay a fair price. Was the Ndali event a success? I, for one, enjoyed it and learned from it. Already, I have had 2 food businesses wanting to follow up the potential for using Ndali vanilla in their products. I call that a success! Here is the recipe for my entry, Pear Vanilla Jam. I selected pears for seasonality as they are just being harvested now and because the colour would show off the vanilla seeds well. Pears have only a medium natural pectin content. 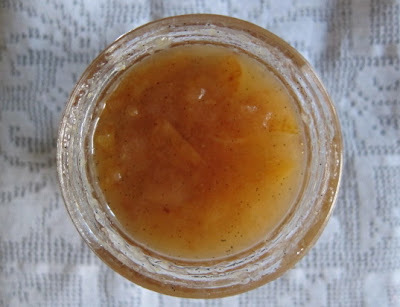 Don't do what I did and think you can reduce the amount of pectin in this recipe. I ended up with a rather looser set than I intended. Not what you want when you're up against a jam-maker as good as Vivien Lloyd. It still tastes good, I think, and can be partnered with cheese or spread on toast. Put chopped pears, sugar and vanilla seeds and pod in a heavy-based pan. Cook over medium heat, stirring to ensure sugar doesn't burn, until it melts and the pear softens. Remove *vanilla pod and mash pears lightly. Bring to a rolling boil and cook for 5 minutes to activate the pectin. Fill the sterilised jars, wipe the rims and apply lids. * Wash the vanilla pod in water, leave to dry thoroughly. Add to a jar of sugar to make vanilla sugar. 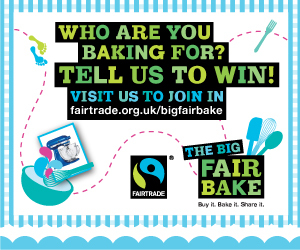 This event coincided rather neatly with the Fairtrade Big Fair Bake taking place this week and next. Why not join in and bake for someone else, I did.